I saw these on Facebook, and like most Facebook 'recipes' from my family, I completely ignored it. I'm generally one to want to do stuff from scratch, and my family is in the 'condensed soup over chicken' camp. However, I have two kids who are home due to cold temps, so I decided to make them a treat. I don't have time to do something from scratch, though, so I though I'd give this recipe a try. Take a can of cinnamon rolls. Heat up your waffle iron, set to medium-low. Put a roll on the center of the waffle iron. Close the waffle iron, pressing down a bit. Wait three minutes. Extract the waffle. 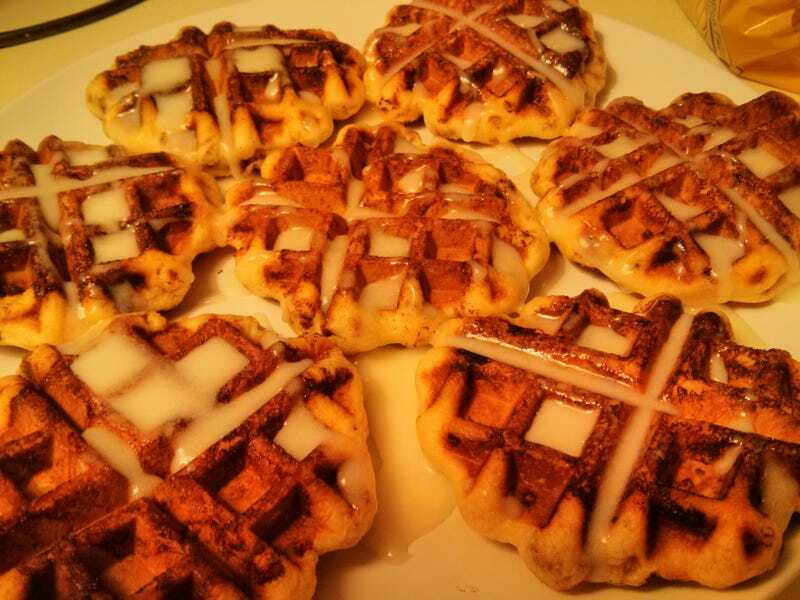 Once all the waffles are done, cover in the glaze that should have come with the rolls.